In 1981, JDC began to witness the “radiating effects” promised when it negotiated its 1980 return to Hungary, as first Czechoslovakia and then Poland invited JDC to resume direct operations. JDC could now provide needy Jews in those countries as well as in Romania and Yugoslavia with adequate food, clothing, and winter relief—along with any amount of “food for the soul” that each government would allow. Well before the fall of communism in 1989, JDC was investing its Eastern European activities wherever possible with Jewish cultural components to help each community reawaken its own Jewish voice. Jewish communal workers were trained, access was furnished to leadership development programs, youth activities were encouraged, camping venues were refurbished and new programs established, and Jewish holidays were enhanced with religious supplies from abroad. The Brookdale Institute was commissioned to study the aging of Jews in Hungary, thereby contributing to social welfare solutions while creating a bridge to Israel. For decades, JDC had also extended an indirect lifeline to Jews in the Soviet Union— enabling refuseniks who had lost their livelihoods after applying to leave for Israel and other Jews at risk to continue to put food on the table. This delicate lifeline, however, could not provide the food for the soul that a massive Jewish population had been denied for 70 years. With JDC’s return to the Soviet satellites, Executive Vice President Ralph Goldman began consulting with trusted advisers to advance the long-term goal of returning to the Soviet Union. A 1986 New York breakfast at which Rabbi Arthur Schneier strategically seated JDC leaders next to the Soviet Minister of Cults resulted in a coveted invitation for JDC to visit the Soviet Union. In January 1988, JDC set foot on Soviet soil for the first time since the closure of Agro-Joint exactly 50 years earlier. Asked to re-create an updated Agro-Joint program, JDC leaders declined, declaring that their primary interest now was to Judaize the Jews of the Soviet Union. Yet in the prevailing atmosphere of glasnost, JDC was permitted to return to the Soviet Union. By the close of the decade, it had established contact with numerous Jewish communities and shipped hundreds of thousands of religious and cultural items that they had requested. It raised Jewish spirits by organizing Jewish music concerts for sellout crowds in major cities; it planned a training program for cantors; and it prepared an inventory of available Russian-language Jewish books as a prelude to offering turnkey Judaic libraries to any community or group that could host one. Meanwhile, in the first half of the decade, the Soviet Union had continued to restrict the outflow of Jews. In 1980 fewer than 22,000 departed, less than half the 1979 figure; by 1984 the number was down to 896. Exit figures began to rise in 1987 under glasnost, and JDC was called upon once again to provide care and support for large numbers of Jews on the move. In 1988 JDC assisted some 18,000 émigrés from the Soviet Union and Eastern Europe—helping shelter these transmigrants in Vienna, Rome, and Ladispoli, Italy. The numbers exploded in 1989, when JDC, with considerable support from the U.S. government, provided an allowance for food and housing and a network of auxiliary services for 68,510 Jewish émigrés. In late 1989 improving relations between Israel and the Soviet Union spawned a breakthrough: direct flights from the Soviet Union to Israel were approved, setting the scene for the floodgates to open and the massive aliyah that soon followed. Combined with a new U.S. government policy mandating that all processing for U.S.-bound Soviets take place prior to their emigration, issues of Jews in transit soon evaporated. In Western Europe, the JDC-supported European Council helped reinforce Jewish identity in the 1980s—especially among small and scattered communities—by developing communal workers and young leadership and providing resource personnel to broaden community life. While emphasizing technical support, JDC aided specific community initiatives in Belgium, Italy, Portugal, and Scandinavia, and a manpower development program in France became a replicable model for communal growth. In Latin America as well, JDC had a special concern for the more remote communities in Argentina, Brazil, Chile, and Uruguay. It brought lay leaders and professionals from Latin America, the U.S., and Israel together to enhance resource development, Jewish education, and leadership efforts.The LEATID Latin American training program was a prime result. In the early 1980s, following the Ethiopian government’s closure of the ORT program that JDC had been supporting, JDC engaged in lengthy negotiations to re-create a lifeline to Ethiopian Jewry. In 1983, as a deepening famine made isolation no longer an option for the regime, JDC was granted permission to operate in Ethiopia and be based in the Gondar region, where a large Jewish population resided, but on condition that its relief and medical programs would be nonsectarian. The projects it subsequently undertook included emergency famine relief, electrification, agricultural recovery, well drilling, and brick making—efforts that earned JDC the trust of the government’s health and welfare sectors. Aliyah was the dream of all of Ethiopia’s Jews. When the hardiest Jews began to flee across the border to Sudan in an attempt to reach Israel, the relatives remaining behind suffered materially. Israel’s Operation Moses lifted thousands of Ethiopian Jews from Sudan to Israel in 1984–85. The Ethiopian authorities ultimately granted JDC the right to attach cottage industries to local synagogues, and the modest income stream derived from these “industries” aided many of the diminished families. Many of JDC’s projects in Ethiopia were funded by an open-mailbox program, established in 1984 to enable North American Jews to respond to the famine crisis as a community, and by grants from the U.S. Agency for International Development and others. 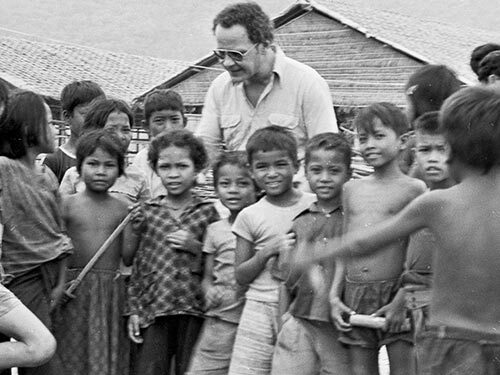 Though JDC’s history is filled with instances of nonsectarian assistance, in 1979 it established the first open mailbox of this nature—to give concerned American Jews a way of assisting Cambodians fleeing to Thailand to escape the Khmer Rouge regime. Similar mechanisms were set up in late 1980, when an earthquake struck near Naples, Italy, and in 1985, when an earthquake hit Mexico and a volcano erupted in Chile. As 1986 drew to a close, JDC chose to make non-sectarian aid a formal part of its mandate by creating the JDC–International Development Program. The severe earthquake that hit Soviet Armenia in December 1988 elicited an overwhelming open-mailbox response. Chartering an El Al plane (a historic flight to the Soviet Union by Israel’s national airline), JDC airlifted 61 amputees and crush trauma patients for surgery, prostheses, and successful therapy in Israel, and it constructed a child rehabilitation center in the severely hit city of Leninakan. Teams of Israeli therapists were sent to train Soviet paramedics and nurses, and in the process, introduced the professions of physical and occupational therapy to the region. The tremendous goodwill engendered would ease JDC’s first steps on its return to the Soviet Union to help revitalize Jewish life. In Israel in the 1980s, to assist with emerging needs, JDC became a research agency and catalyst for and a coordinator of projects to absorb newcomers from the Soviet Union and Ethiopia. To protect its delicate standing in Ethiopia, it created a separate society called Amishav to carry out activities related to the Ethiopian olim. JDC intensified its focus on the health and well-being of children and youth as well as its supportive cooperation with the Israel Association of Community Centers, thereby helping strengthen programs serving socially and economically disadvantaged populations and special needs populations. Emphasizing local initiative and control, it concerned itself less and less with the management of programs, working instead to encourage, advise on, and fund the development of new programs that—once their value was demonstrated—were carried out largely by other entities. During that period, the JDC Brookdale Institute expanded its role as a national resource for society-wide efforts on behalf of the elderly, focusing on long-term care and the training of geriatric professionals, while ESHEL pioneered day care centers for frail elderly and helped establish regionwide services. Manpower development needs in Israel gained high priority, and ELKA was established in 1983 through the combined initiative of JDC and the Israeli government to improve the level of management in the civil service, “especially in fields concerned with social issues.” Since 1982, the Center for Social Policy Studies in Israel (now the Taub Center for Social Policy Studies in Israel) has been striving to enhance the policy-making process with regard to those issues, with the aim of advancing the well-being of all Israelis.